resolution. 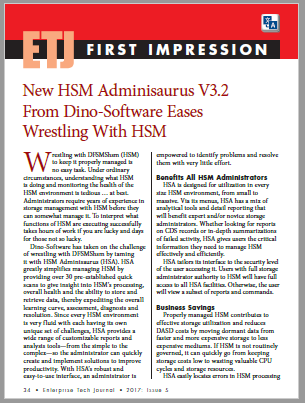 Since every HSM environment is very fluid with each having its own unique set of challenges, HSA provides a wide range of customizable reports and analysis tools—from the simple to the complex—so the administrator can quickly create and implement solutions to improve productivity. With HSA’s robust and easy-to-use interface, an administrator is empowered to identify problems and resolve them with very little effort. HSA tailors its interface to the security level of the user accessing it. Users with full storage administrator authority to HSM will have full access to all HSA facilities. Otherwise, the user will view a subset of reports and commands. Properly managed HSM contributes to effective storage utilization and reduces DASD costs by moving dormant data from faster and more expensive storage to less expensive mediums. If HSM is not routinely governed, it can quickly go from keeping storage costs low to wasting valuable CPU cycles and storage resources. HSA easily locates errors in HSM processing and can establish solutions for error elimination. It can also identify processing patterns and users who are unintentionally compromising HSM’s ability to successfully manage the storage environment. Create repair functions using report results as input. HSA saves HSM from wasting resources or ineffectively managing the storage environment by using extensive health reporting. Problem areas such as thrashing activity, failures in HSM processing, CDS and data integrity and much more are monitored. A built-in health summary scan identifies current issues within HSM plus detects instances where HSM should have processed data but didn’t. A full CDS auditing and error fix facility—manual and automatic fix capabilities—to identify and correct issues within the HSM environment to ensure data availability. Audits which typically can take hours or days to complete are reduced to minutes. The full-featured and customizable interface supports both batch and ISPF, allowing users to perform any task in their preferred method. In all, over 200 reports and commands are available so the storage administrator can easily manage HSM.